Definition of Ethics Ethics is defined as a system or a moral code of a particular person, religion, group or profession or any other social units. Ethics. 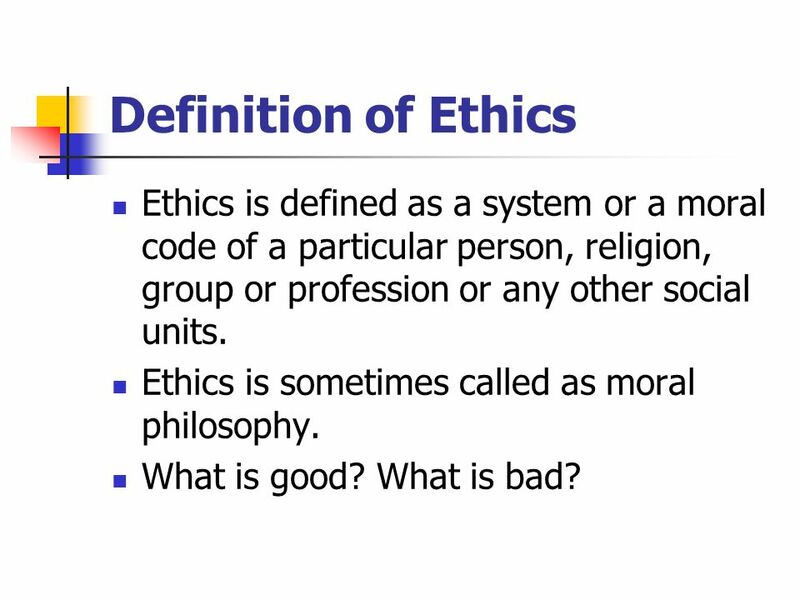 1 Definition of Ethics Ethics is defined as a system or a moral code of a particular person, religion, group or profession or any other social units. Ethics is sometimes called as moral philosophy. What is good? What is bad? 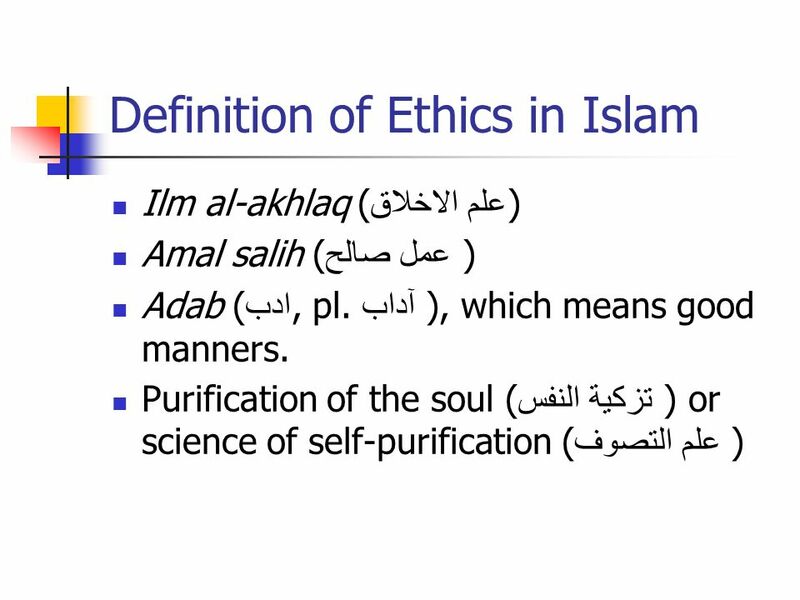 4 The Foundation of Ethics in Islam A. Division of Knowledge 1. Knowledge as the Real Knowledge Based on al-Quran and the Sunnah of our beloved Prophet Muhammad(SAW) 2. Knowledge as Information Other knowledge that is derived not from the two main sources. 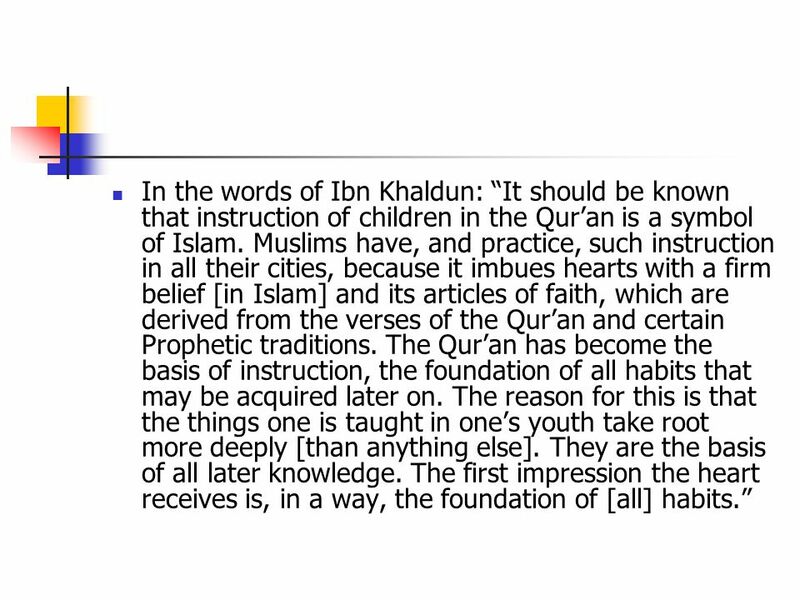 5 In the words of Ibn Khaldun: It should be known that instruction of children in the Quran is a symbol of Islam. Muslims have, and practice, such instruction in all their cities, because it imbues hearts with a firm belief [in Islam] and its articles of faith, which are derived from the verses of the Quran and certain Prophetic traditions. 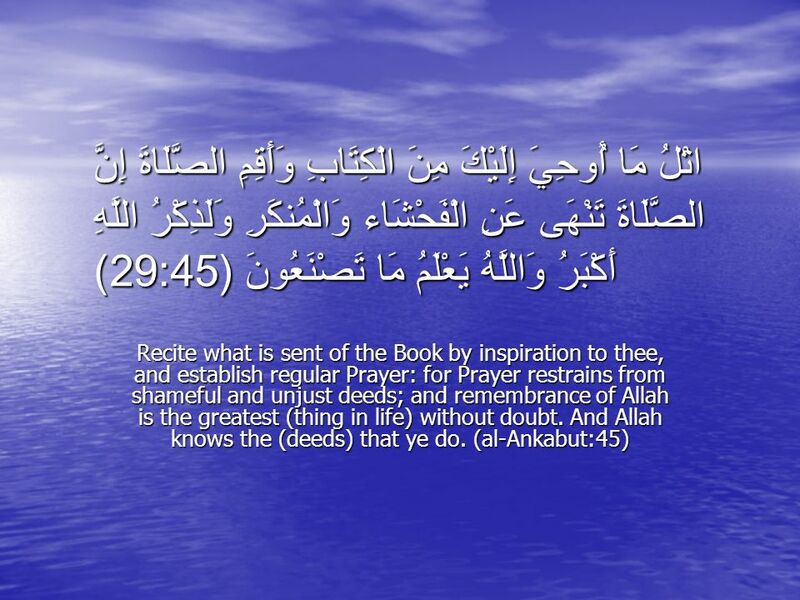 The Quran has become the basis of instruction, the foundation of all habits that may be acquired later on. The reason for this is that the things one is taught in ones youth take root more deeply [than anything else]. They are the basis of all later knowledge. The first impression the heart receives is, in a way, the foundation of [all] habits. 6 B. The True Servant (abd) of Allah SWT Our beloved Prophet Muhammad (SAW). 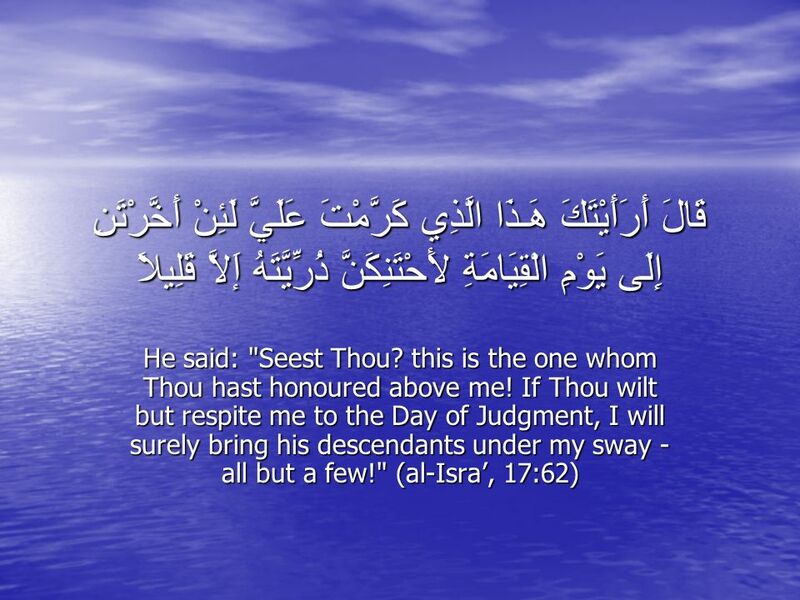 Aishah (RA) said, The character of the Emissarry of God (SAW) was the Quran. 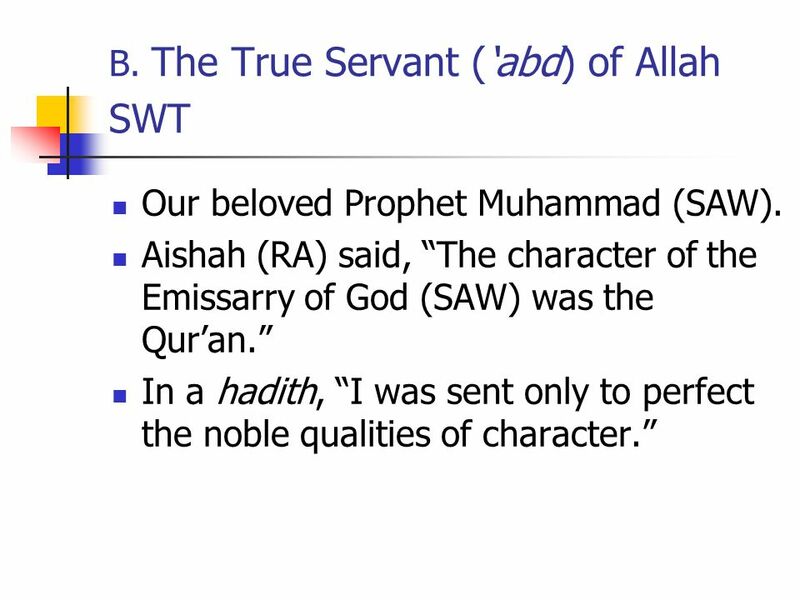 In a hadith, I was sent only to perfect the noble qualities of character. 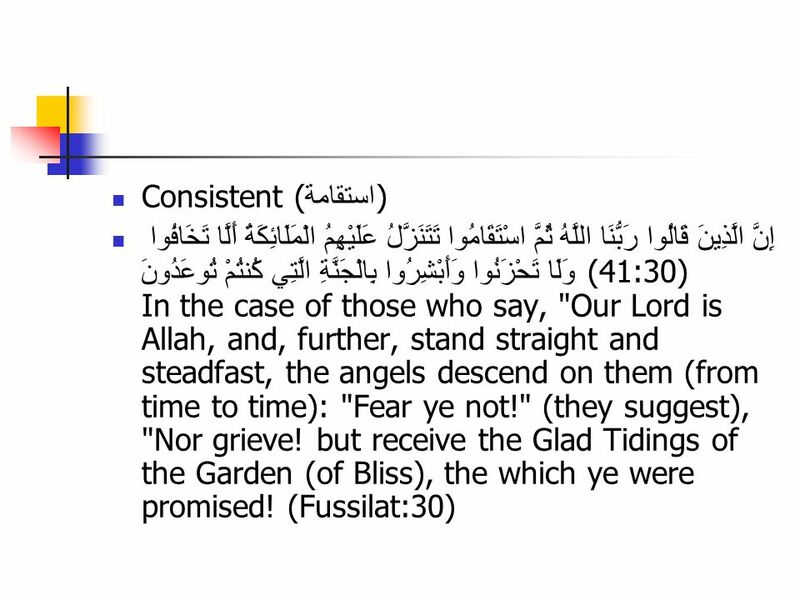 9 C. Servanthood ( عبدالله ) To serve Allah SWT by remembering Him. فَاذْكُرُونِي أَذْكُرْكُمْ وَاشْكُرُواْ لِي وَلاَ تَكْفُرُونِ Then do ye remember Me; I will remember you. Be grateful to Me, and reject not Faith. 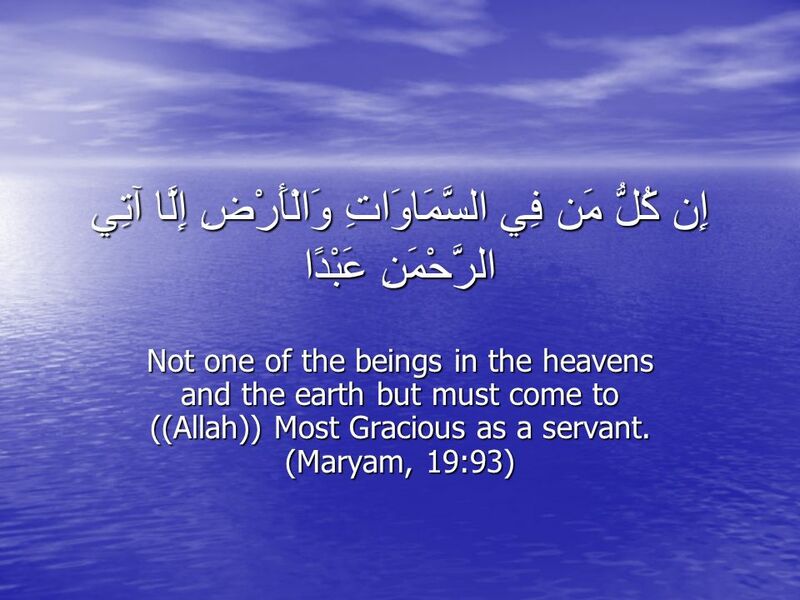 (al-Baqarah:152) To serve Him by serving His creatures for His Cause. 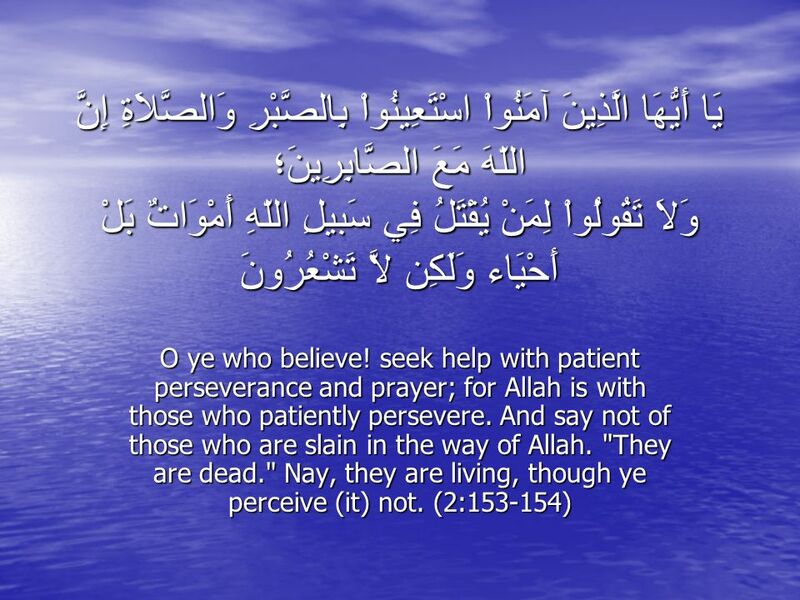 13 إِنَّ فِي خَلْقِ السَّمَاوَاتِ وَالأَرْضِ وَاخْتِلاَفِ اللَّيْلِ وَالنَّهَارِ لآيَاتٍ لِّأُوْلِي الألْبَابِ (3:190) الَّذِينَ يَذْكُرُونَ اللّهَ قِيَامًا وَقُعُودًا وَعَلَىَ جُنُوبِهِمْ وَيَتَفَكَّرُونَ فِي خَلْقِ السَّمَاوَاتِ وَالأَرْضِ رَبَّنَا مَا خَلَقْتَ هَذا بَاطِلاً سُبْحَانَكَ فَقِنَا عَذَابَ النَّارِ (3:191) Behold! in the creation of the heavens and the earth, and the alternation of night and day,- there are indeed Signs for men of understanding. 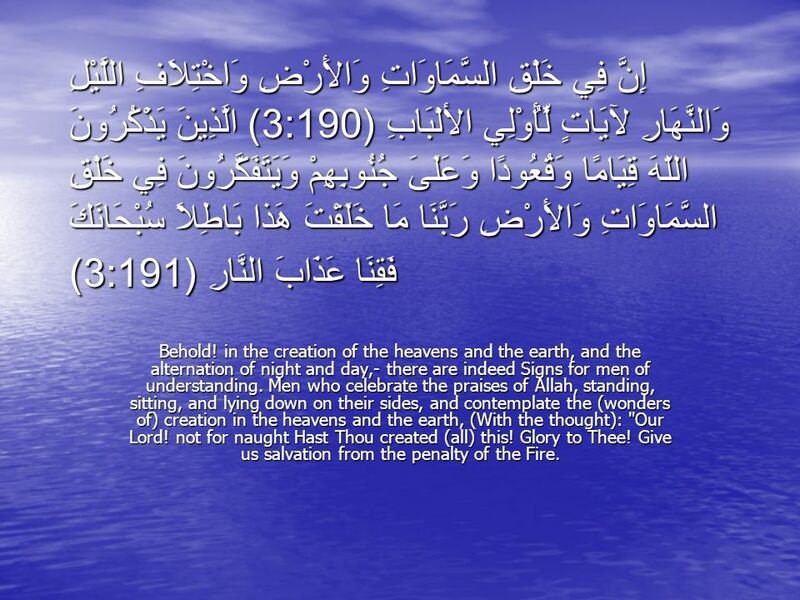 Men who celebrate the praises of Allah, standing, sitting, and lying down on their sides, and contemplate the (wonders of) creation in the heavens and the earth, (With the thought): "Our Lord! not for naught Hast Thou created (all) this! Glory to Thee! Give us salvation from the penalty of the Fire. 15 Right Intention and Determination. 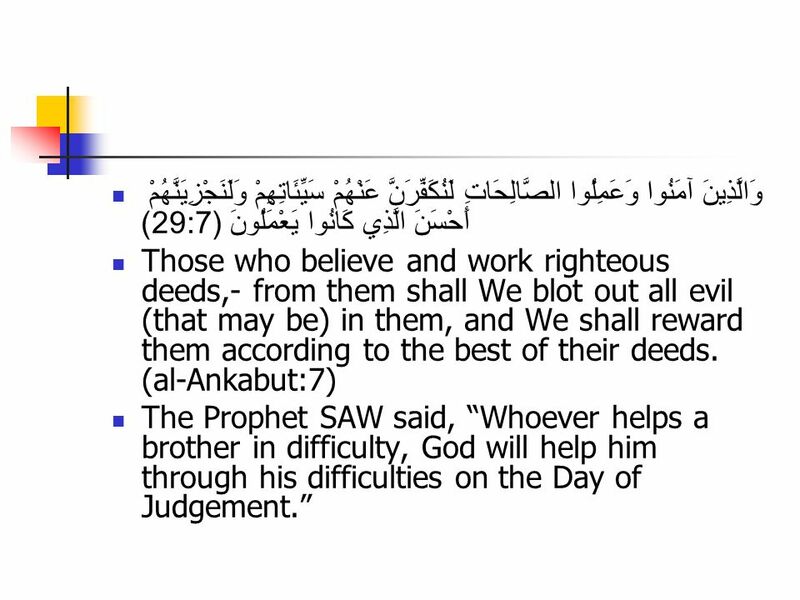 Right intention means to do every action for the sake of Allah SWT and His Prophet Muhammad (SAW). 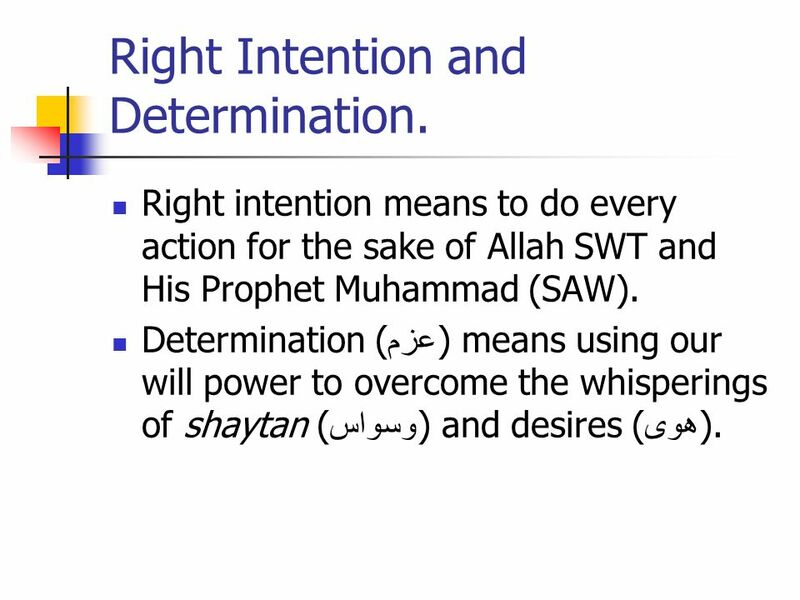 Determination ( عزم ) means using our will power to overcome the whisperings of shaytan ( وسواس ) and desires ( هوى ). 19 Continuous Learning and Reminding Continuous learning of the first kind of knowledge. 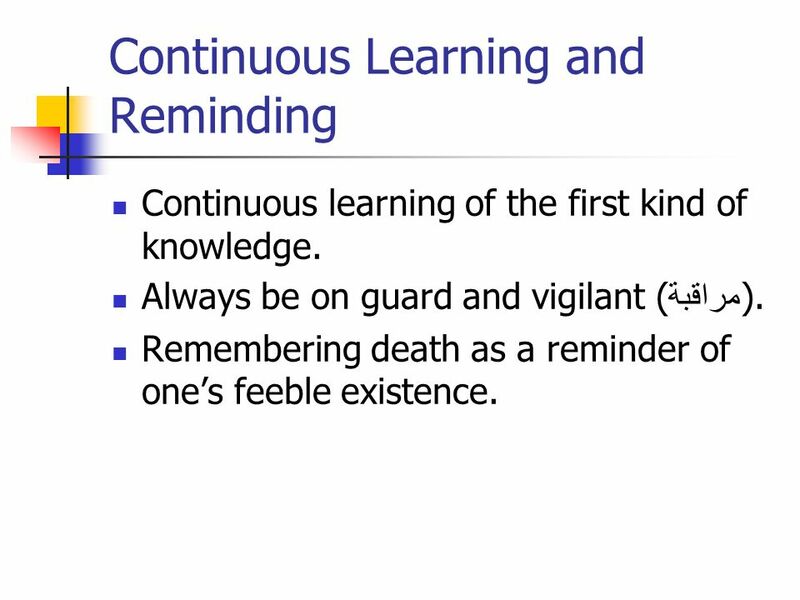 Always be on guard and vigilant ( مراقبة ). Remembering death as a reminder of ones feeble existence. 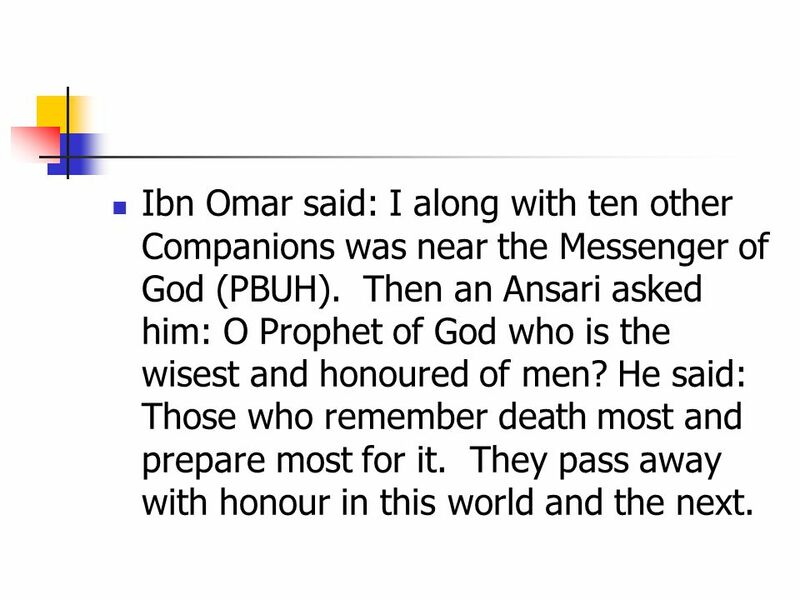 21 Ibn Omar said: I along with ten other Companions was near the Messenger of God (PBUH). Then an Ansari asked him: O Prophet of God who is the wisest and honoured of men? He said: Those who remember death most and prepare most for it. They pass away with honour in this world and the next. 22 Caliph Harun Ar-Rashid has a servant, by the name of Bahlul ( بهلول ), who is a bit fool and unwise. 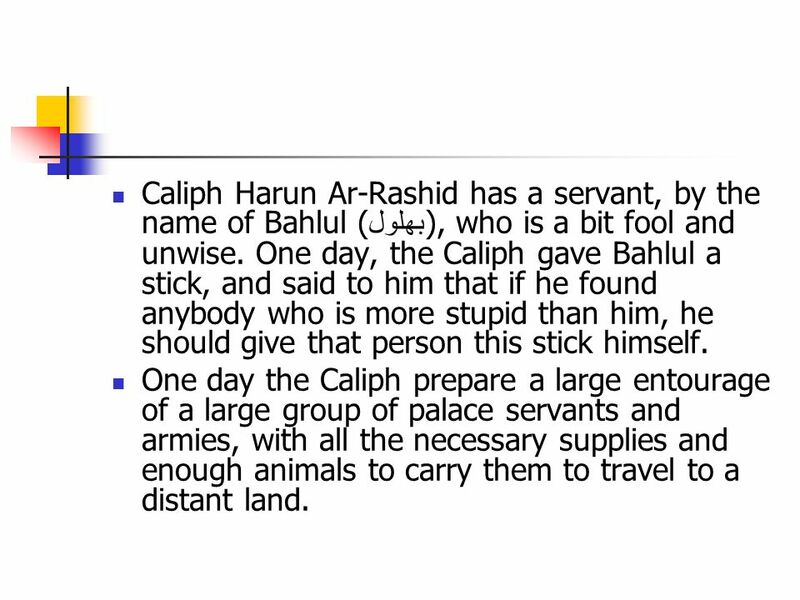 One day, the Caliph gave Bahlul a stick, and said to him that if he found anybody who is more stupid than him, he should give that person this stick himself. One day the Caliph prepare a large entourage of a large group of palace servants and armies, with all the necessary supplies and enough animals to carry them to travel to a distant land. 23 He said to Bahlul: See Bahlul I have made an extensive preparation for this journey, but there is another journey that all human beings will go. Bahlul asked, What is that? The Caliph said, The journey to the next life. Bahlul asked again, What is that? The Caliph said, The eternal life after our temporary life in this world. Bahlul asked, Would you made the same preparation for that journey? 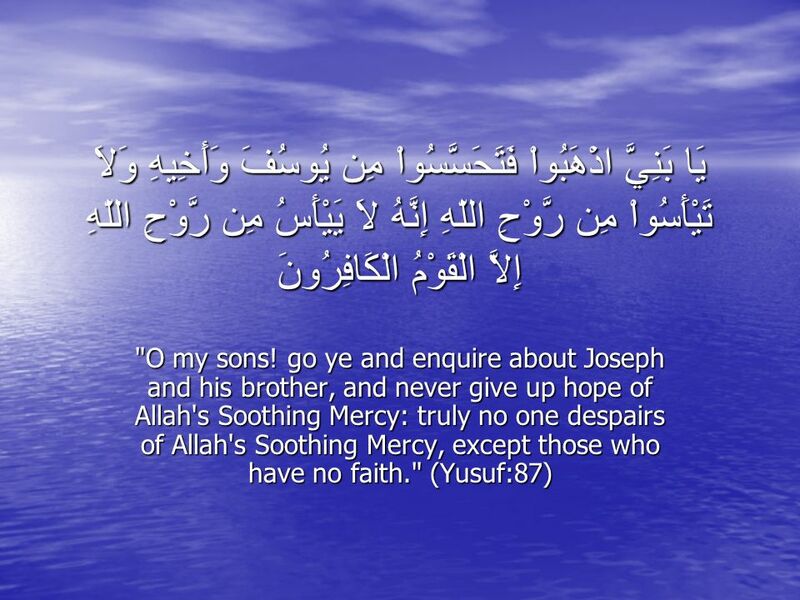 The Caliph said, No, in that journey, Im going alone! 24 Then Bahlul said, In that case, I have found the person to whom I should give the stick that you have given to me. You made a large preparation to that distant land, but you are not going to make the same preparation to a place where you will dwell in forever. Hearing this, the Caliph Harun ar-Rashid was dumbfounded. 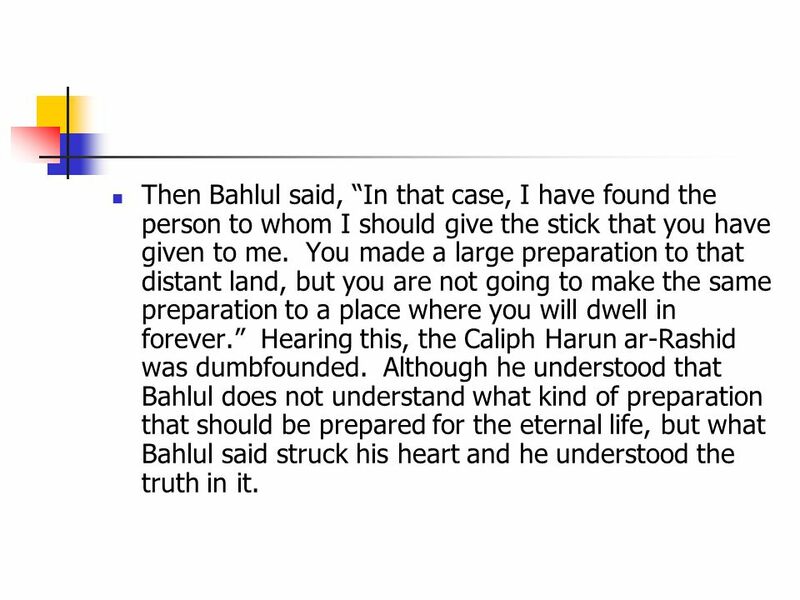 Although he understood that Bahlul does not understand what kind of preparation that should be prepared for the eternal life, but what Bahlul said struck his heart and he understood the truth in it. 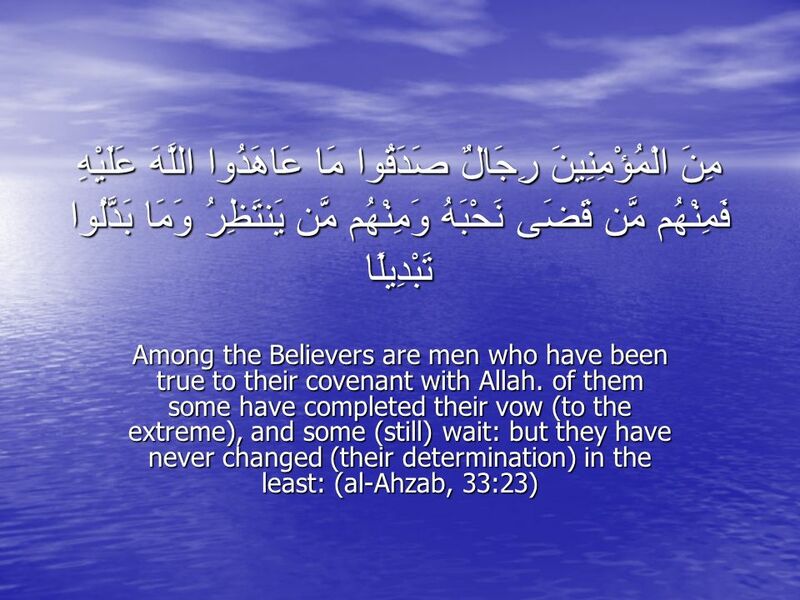 25 Association with the Pious and Religious People. The need for a teacher is a must, since seeking for any kind of knowledge requires a teacher, and so does in the way of purifying ones soul. 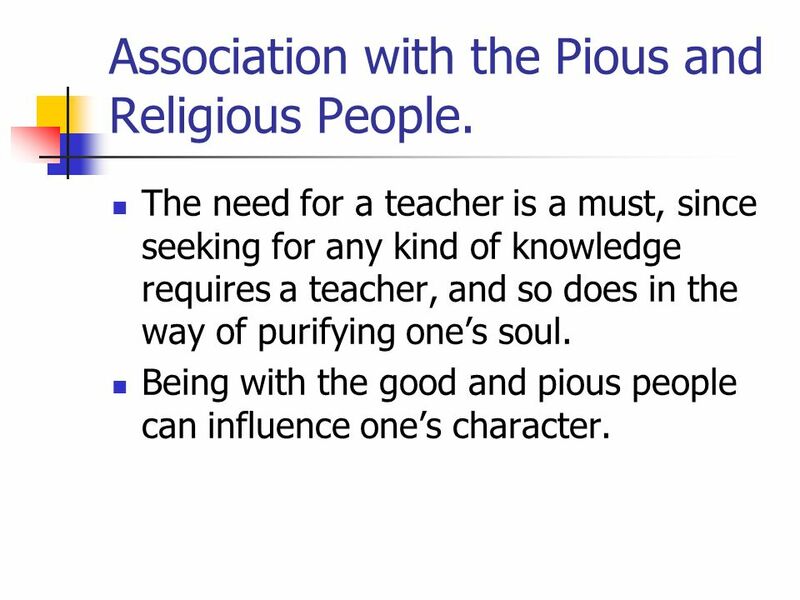 Being with the good and pious people can influence ones character. 26 يَا أَيُّهَا الَّذِينَ آمَنُواْ اتَّقُواْ اللّهَ وَكُونُواْ مَعَ الصَّادِقِينَ O ye who believe! 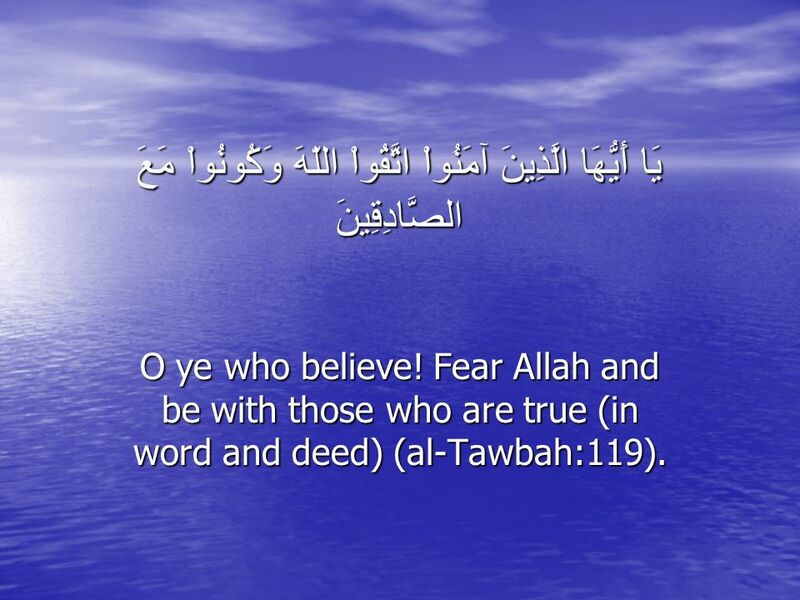 Fear Allah and be with those who are true (in word and deed) (al-Tawbah:119). 28 Abu Hurayrah ( رضي اللّه عنه ) reported that the Messenger of Allah ( صلّى اللّه عليه و سلّم ) said, Truly Allahmay He be exaltedhas said: Whosoever acts with enmity towards a friend of Mine, against him will I indeed declare war. Nothing endears My servant to Me than doing of what I have made obligatory upon him to do. And My servant ceases not seeking My nearness by offering supererogatory ( نوافل ) prayers till I love him. When I love him, I shall be his hearing with which he shall hear, his sight with which he shall see, his hands with which he shall hold, and his feet with which he shall walk; and if he asks Me, I shall surely give him, and if he takes refuge in Me, I shall certainly give him refuge. 29 Practices Sincere Repentance ( توبة نصوحة ) وَتُوبُوا إِلَى اللَّهِ جَمِيعًا أَيُّهَا الْمُؤْمِنُونَ لَعَلَّكُمْ تُفْلِحُونَ (24:31) And O ye Believers! 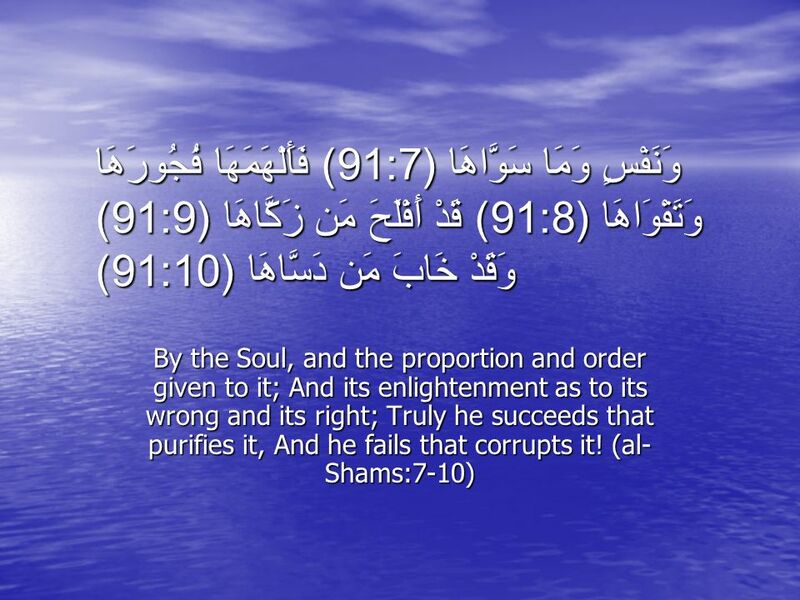 turn ye all together towards Allah, that ye may attain Bliss. On the authority of Anas b. Malik, the Messenger of God (SAW) is reported to have said, There is nothing more loved by God than the youth who repents. 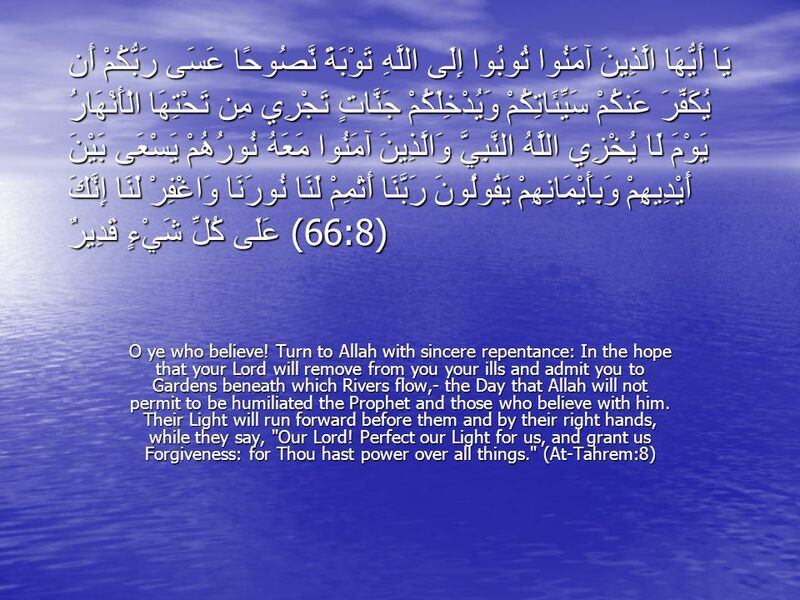 35 وَالَّذِينَ آمَنُوا وَعَمِلُوا الصَّالِحَاتِ لَنُكَفِّرَنَّ عَنْهُمْ سَيِّئَاتِهِمْ وَلَنَجْزِيَنَّهُمْ أَحْسَنَ الَّذِي كَانُوا يَعْمَلُونَ (29:7) Those who believe and work righteous deeds,- from them shall We blot out all evil (that may be) in them, and We shall reward them according to the best of their deeds. (al-Ankabut:7) The Prophet SAW said, Whoever helps a brother in difficulty, God will help him through his difficulties on the Day of Judgement. 36 Sources: Bakar, Osman, Classification of Knowledge in Islam, Kuala Lumpur: ISTAC, IIUM, 2006. Imam Al-Ghazzali, Ihya Ulum-Din, trans. Fazlul Karim, New Delhi: Islamic Book Service, 1991. Kabbani, Shaykh Muhammad Hisham, Self- Purification and the State of Excellence, Mountain View: As-Sunna Foundation of America, 1998. Download ppt "Definition of Ethics Ethics is defined as a system or a moral code of a particular person, religion, group or profession or any other social units. Ethics." ALL SCRIPTURE REFERENCES CONTAINED HEREIN ARE FROM THE KING JAMES BIBLE AND ARE USED BY PERMISSION OF THE AUTHOR. SCENARIO A girl named Zohra Misbehaves in school with the teacher Quarrels with her friends Comes home and shouts at her mother Goes off to sleep and. Role of the Scripture in Spiritual Growth Mahmoud Haddara May 2008.